London is a fun city to visit, whether you’re in town to see the major sights, try to catch a glimpse of the Royals, or to see some West End shows. But we all have to eat, so why not throw in a few foodie activities too! Some of my favorite things to do in London have to do with food, and I always advocate adding foodie things to do to your itinerary, in order to learn a bit about the food culture and have fun while eating. You might be surprised by how many fun foodie things there are to do in London. People often think England doesn’t have any good food – or that it consists merely of fish and chips and pub food. But that couldn’t be farther from the truth. In fact, London is one of the biggest food cities in the world. You can find every type of cuisine imaginable in the city. Find your favorites cuisine here. Paris is only a short train ride away. Check out these fun food things to do in Paris. Borough Market is one of the most popular in London, and for good reason. There are dozens of food shops and stalls in the market, catering to both locals and tourists. You have your pick of about a dozen street food stalls where you can grab a mouthwatering pork sandwich, or some of the best Caribbean food. Or you can head to one of the other dozen or so restaurants that line the market. No matter what, you won’t go hungry here. It’s one of my favorite places to go for lunch, because of the variety. Just remember, it’s super popular, so it’s best not to go directly at lunch time, if possible. There are plenty of choices for breakfast too, so maybe try to make it your first stop of the day (10am). Borough Market also features market talks where they discuss a variety of food-related topics. And there’s a demo kitchen too, where you can watch various recipes being made. If you want to learn some history about the market while eating your way around the various vendors, I’d recommend setting up a private food tour with London Tailored Tours. They can also set you up with many different types of tours around the city. Let them be your expert guides. Pro Tip: The line is often formidable, but do not leave Borough Market without trying the raclette potatoes at Kappacasein. Afternoon tea is such a quintessentially English thing to do. Of course, you should slow down long enough to experience afternoon tea at least once while you’re in London. If you’re looking for somewhere to have afternoon tea in London, you really don’t have to look very hard. Almost all of the high-end hotels and restaurants in London have one. Where you go really depends on how fancy you want to get. 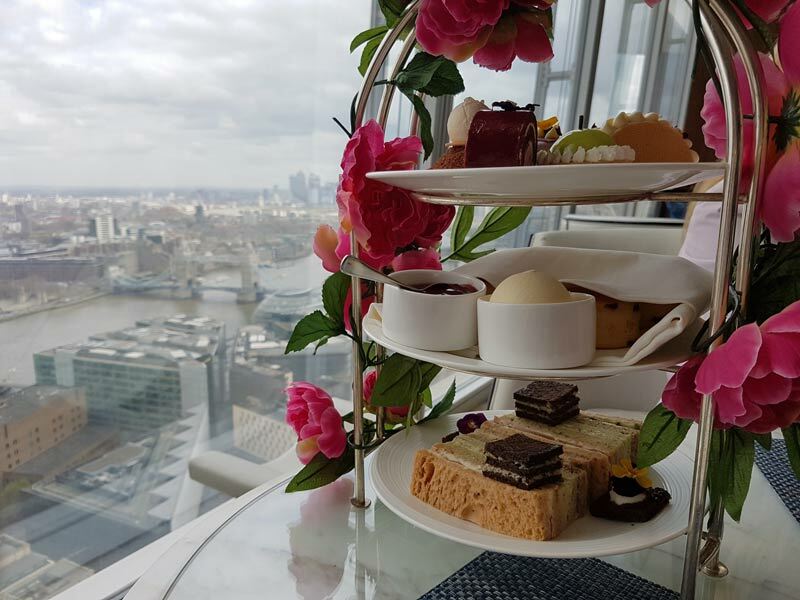 One of the best afternoon teas I’ve had in London is at the Shangri-La Hotel at the Shard. As you can see from the photo above, the Luxury Afternoon Tea at the Shangri-La includes a beautiful plate of food (just look at those desserts! ), along with an equally beautiful view. If you only indulge in one afternoon tea in London, this one is a must. There are 30 teas to choose from and you can even add a glass of Champagne to start things off right. Details: Book Here, £60, 12pm – 4pm (Mon – Sun) last seating at 4pm. Pro Tip: While I love afternoon tea, I’m also a fan of cream tea, which consists of just scones and tea. It’s a good option if you’re not prepared for the full afternoon tea experience. Soho is a neighborhood in London with a very unique history. You’ll learn the story and see some remnants of this history as you walk along the bustling streets of Soho with Eating London, called the Soho Food & Cocktail Tour. The tour will take you to a number of top food establishments in the neighborhood where you’ll be treated to a plate of food and a cocktails. In my opinion, it’s the best way to experience this neighborhood, because it’s absolutely jam packed with restaurants and bars, many of which have secret entrances. The tour lasts about 3.5 hours, from late afternoon through to evening. It’s a great way to try a bunch of places, eat lots of different things, and not have to worry about dinner! You’ll sample everything from tacos, to dumplings to Spanish pintxos. ⇒ We love this tour, and we know you will too! Check out the schedule and book your tour. Gin Tonic is a major theme in London right now. I’m not much of a gin fan typically, but I can totally see why there’s a craze around it right now as soon as the bowl glass full of ice and gin arrives at the table with my preferred tonic. It’s something special. And you really can’t visit London without at least trying one or two. My favorite place to try different combinations is The London Gin Club in Soho. It’s a fun environment (small and always packed), with oh so many gins to choose from. They also have a small food menu and some cocktails. If you love gin, you’ll find it hard to leave here, because of the abundance of choices. They have five different gin tasting menus so you can try four different gins, back to back. Pro Tip: If you don’t like gin for its often potent juniper scent and bitterness, try Tanqueray Rangpur. It has more of a fruity, lime taste. The London Gin Club is open most days from 4pm (Saturday from 1pm) and closed Sunday and Monday. You might want to reserve a table in advance. They have a couple of fun tasting events you can partake in too. Check the website for details. There’s no better way to combine two great London experiences in one than by enjoying a gourmet meal aboard a double-decker sightseeing bus. The company that offers this fun and tasty experience is called Bustronome. Their innovative double-decker restaurant on wheels began in Paris and extended its tours to London in summer 2018. You can now climb aboard for a 4-course lunch, afternoon tea, or 6-course dinner. While you’re dining aboard, the bus will be passing by all the top London sights. You can use the menu/map to pinpoint your location. Each of the top sights along the way offers a short audio message you can listen to on the audio pen. You might think this experience is super touristy, but that’s very far from the truth. If feels like you’re at a fine dining restaurant. There are no announcements or annoying interruptions. You’re free to just enjoy your meal and the view. Check out the schedule and offerings here. I love this street food market because of it’s awesome location, and because it has the highest concentration of really good food options of any of the street food meccas we’ve been to in London. Don’t worry about getting overwhelmed, though. It’s just ONE street, and a small one at that. It can also be a bit hard to find, because its home is under the railway arches in Bermondsey. The alley is actually used as a salvage lumberyard during the week. So when the food stalls come in on the weekend, they crowd into the arches among stacks of lumber and discarded piles of wood. To say this is a “market” is a bit of an overstatement. It’s really just an alleyway full of fantastic food. There are actual restaurants on the left and pop up food stalls on the right. The alley is packed at all times. The food is often incredible, not just okay, like many outdoor markets manage. I’d give a list of my favorites, but they often aren’t there for long. You’ll have to do your own food scouting! However, if you see the steak in the photo above, drop everything immediately and get in line. Check out these other London markets too. If you’re looking for a fun place to eat, where there are dozens of choices and all of them are worth your time, be sure to stop by the expanding Mercato Metropolitano market in the Elephant & Castle area. It’s a creative space, with the feeling of being in a funky old warehouse – it’s actually an old paper factory. The food stalls are spread out in three different areas, with plenty of seating and walking space, so it rarely feels crowded (except in the height of summer). The food is primarily Italian – I ate the most incredible tagliatelle with sausage ragu – but there are many other choices, from burgers to Vietnamese specialties, Argentinian steak, burritos, etc. They also have a fairly large Italian market, where you can find all kinds of Italian products that are hard to find elsewhere. If you’re around for a while, you can even catch an event at the market. They host movies, live music performances, and educational events, including special cooking classes. They are open from 8am on weekdays, 11am on weekends, and close at 10 or 11pm. Check their website for details. Bottles is a new wine bar in Spitalfields Market. You can enter this trendy wine shop from outside the market, on Brushfield Street, but the shop extends right into Spitalfields Market, so you can do some shopping and then stop for a glass of lovely Italian wine and still feel like you’re immerse in the market experience. To make the connection, Bottles is brought to you by the same owners as the Bottles & Battles in Mercato Metropolitano (see above). They are focused on Italian wine and food pairings – and believe me, the food is divine. We had a beef carpaccio and a white fish crudo. Both were very good. One of the best things about Bottles is the interior. It feels like walking into a wine cellar, with brick walls, dim lighting and wine stacked up to the ceiling. There are various spots to sit – from the airy market space, to the communal table on the lower floor. No matter where you choose, it’s inviting and relaxing. You can reserve a table on their website. On Saturdays, the Duke of York Square, in Chelsea, near Sloane Square Underground Station, perks up with more than a dozen food stalls, selling everything from empanadas to falafel and sushi. It’s the place to be on a nice Saturday. You can grab a glass of bubbly and walk around being tempted by all the delicious food options, before deciding what to have. There’s not really a lot of room to sit with your food, but this is an activity! So standing is required. If you love food markets and want to check out another one, try the Real Food Market, which takes place Friday-Sunday in Southbank Centre. The Shard is Western Europe’s tallest building and one of London’s most recognizable icons. The view from the top viewing platform is simply mesmerizing. The View from the Shard experience offers visitors the opportunity to see London from above, like never before. And there’s no better way to enjoy the view than with a glass of Champagne in hand! There are audio and visual guides available at the top, so you know what you’re looking at and can learn a bit about the history of London while you walk around. There are two viewing platforms, on level 69 and level 72. The lower level has interactive viewing telescopes that can be aimed at any area, or even any building, in the landscape, and it will tell you the name and history of the location. The 72nd floor is the highest floor accessible to visitors and is an open air deck. During the summer, the Skydeck even has a bar with snacks and drinks, plus some fake grass to sit on and feel like you’re having a picnic in the sky! Pro Tip: You’ll receive a discount on ticket prices if you reserve in advance. Reserve tickets here. What if you could replicate the experience of being among friends at a house party, eating and drinking together and having a fantastic time together? That’s what the group of flatmates who formed The Little Blue Door are hoping to do for you. They host house parties that you can join in. You’ll be dining among strangers who quickly become friends, in a townhouse in Fulham. Everyone is welcome. Dinner starts with cocktails in the lounge, where you can mill around and meet people, or just have a nice relaxing drink. Then you’ll move to the kitchen, where tables are set for the perfect dinner party. Food is passed around, cocktails are enjoyed. It’s really just a bit of fun. I joined a dinner party at The Little Blue Door in Fulham, but there are many colored doors open up around the city. Be sure to check it out and make a reservation early! If you love street food experiences, you cannot miss Dinerama in Shoreditch. It’s a two-level conglomeration of food stalls and bars, all offering something unique and delicious. What makes this place so unique is the location. The Street Feast concept is to take over derelict and run down buildings and locations around the city and turn them into cool places to eat and drink. At Dinerama, there’s tasty BBQ, pizza, Taiwanese steamed buns, prawns, donuts… Take your pick! Dinerama is not the only street feast in London. If you like this type of food concept (and why wouldn’t you!) you can check out the other locations in Canada Water, Dalston, Lewisham, Battersea and Bermondsey. Each location is completely different and has different food stalls, so you really should check them all out! Pro Tip: Show up before 7pm for a discount on admission and a whole lot less people to dodge. If you are lucky enough to be visiting London on a Sunday, then you absolutely cannot miss the chance to have a proper Sunday Roast. You can find this incredible, hearty plate of food at just about any pub or restaurant in London. It consists of a slice of roast meat (pork belly, prime rib beef, chicken, etc), a huge and puffy Yorkshire pudding, and roasted potatoes and vegetables. It’s a very filling and satisfying meal. Of course, you’ll want to pair it with a true English ale for the full effect. Some of our favorites Sunday roasts are from small, local pubs that have been serving this dish for ages. But there are a few standouts that you can try, if you’re looking for one of the best in the city. Try one of these famous roasts: Blacklock in Soho, Hawksmoor (various locations), Roast in Borough Market, The Princess of Shoreditch. East London has some super trendy places to hang out, including Shoreditch, Brick Lane and Spitalfields Market. All of these locations have more food than you can even wrap your head around. On Sundays, Brick Lane turns into an outdoor market, complete with tons of food stalls. But even on a regular day, it’s a foodie paradise, especially if you love Indian food. One of the best ways to try some of the food in this area is to go on a food tour. We love the East End Food Tour by Eating Europe, a 4-hour tour that includes the best of the area, like a stop at Beigel Bake for salt beef bagels, and Poppies for fish and chips. There’s also a Brick Lane Flavors of India Food Tour you can take in the area. Even if you’re not able to join a tour, you can easily make your own food crawl through this area. As previously mentioned, Dinerama is located in Shoreditch, and so is another great food stall conglomeration, called Boxpark. For a lunch crawl, start at Boxpark, work your way down Brick Lane towards Spitalfields Market. I have always wanted to make my own sourdough bread. I often hear from friends that they have their own starter in the fridge, ready to make a loaf of bread whenever they want and it makes me jealous. Well, now I can satisfy my curiosity for making sourdough at one of the best bread bakeries in London, Bread Ahead. You can take a full day, half day or multi-day class with them, learning things like how to make Indian flat bread, English baking, and sourdough. They have a convenient location in Borough Market where the class takes place. They don’t have one every day though, so make sure you plan well in advance to make sure they can accommodate you during your visit. See Bread Ahead’s Website for more information and a class schedule. London isn’t a city where you’ll find a lot of urban wineries or even microbreweries. That’s what makes these two unique, and is a great reason for you to make a special trip to the East Side. Down a small alley, just one block from the Bethnal Green Underground station, you’ll find London’s first urban winery, Renegade, and next door, Old Street Brewery. Renegade Winery was started in March 2016 by two guys with a passion for wine and a crazy plan to start an urban winery. They source grapes from all over Europe to create their own style of wine, ranging from Sauvignon Blanc from Bordeaux (made in London, of course) to a naturally fizzy Rose from Italy and Spain, among others. The wine bar is located in railway arch in Bethnal Green and it has quickly become one of the hot places to hang out on the weekends in that area. Arrive on the early side and have a taste of their wines, then stay for a glass or two or take some home to enjoy. Old Street Brewery & Taproom was started in 2016 by two friends (an American and a Finn) who were bartending together at a local pub. They started brewing in small batches in a flat in Old Street, before opening their taproom in the old railway arch in Bethnal Green in early 2018. At any given time, they plan to have 3 or 4 craft beers to try in the taproom. Rather than sticking with specific beers, they will be offering small batches of popular or experimental beers that will rotate. We stopped in to try some recently and had an American-style hoppy IPA and a brown ale – both very good. Stop by the taproom on the weekends and you’re likely to find a rowdy crowd of beer lovers enjoying a few pints. Check their website for opening hours. You may have already heard that Brick Lane, in East London, is an Indian food mecca. Absolutely correct. There are dozens of Indian Restaurants to choose from. But the more exciting thing to do on Brick Lane happens every Sunday. A large swath of Brick Lane, from Shoreditch down to Spitalfield’s Market, becomes a pedestrian street filled with food stalls of all kinds, vintage and antique finds, plus a whole lot of other stuff – you can even buy deodorant and eye liner at some of the stalls. It’s called the Sunday Up Market. We go mostly for the food. There are so many choices! Two of our favorites are German sausage from Mr. Sausage (complete with all the toppings) and Pork Belly Bao. You may have seen pictures of these gorgeous gelato roses, made from different flavors of gelato on a cone. They are almost too artful to eat! At Amorino (locations throughout London) you can choose your flavors and have the very skillful gelato artist make you a masterpiece. The flavors are equally as good as the cone looks. Choose from unique flavors like Lime Basil, Dulce de Leche, Tiramisu and Straciatella. Amorino is a Paris-based gelato cafe that has opened shops around Europe. You can find a cafe in many of the top neighborhoods of London, including Soho, Covent Garden, and Islington. Check out their flavors and various other treats. Have you ever been to a wine bar with enomatic wine dispensers? If not, you’re in for a real treat at Vagabond. It’s not a typical wine bar – it’s so much more! The enomatic dispensers make it possible for them to offer dozens of wines by the glass that are served at the perfect temperature. All you have to do is purchase a wine card (there is a £5 deposit for the card, which you get back if you turn the card in), and fill it with your preferred amount of money. Then you take the card to the machines and, when you’ve decided which wine you want to try, you put the card in the machine and fill your glass. There are three different size pours you can choose from – so you can have a taste, a small, or a large pour. They have multiple enomatic dispensers, each with around 10 bottles of wine to choose from, so basically endless choices. Alongside the wine, they also serve a few choice small plates that pair well with wine (think cheese and charcuterie). You can make a table reservation on their website, but it’s not always necessary. They’re open every day from 11am to 10 or 11 pm. Check their website for details. Our favorite locations is at Victoria Station (west London). There’s also one in Clapham Junction and a few other locations. If you happen to be in London on a Sunday, be sure to check out Bedales Spitalfields’ event calendar. They host a wine pub quiz (held various Sundays at 5pm – check the schedule online). For two hours, you’ll join other wine lovers (both locals and visitors) in testing your wine and general trivia knowledge. The quiz is split into 3 rounds; each round features a wine that you must identify, and 10 trivia questions you must answer correct for a chance to wine it all! The prize for the winner is a bottle of wine that can be drank in house or taken away. Tickets for the quiz are only £10, which includes entry to the quiz and 3 small glasses of wine (which can be shared by 2 people). Bedales has many weekday events as well, so be sure to check their schedule. ⇒ Traveling to London via Stansted Airport? See the fastest, easiest way to get to London from Stansted (and book your tickets). Believe me when I say there are probably a million other great foodie things to do in London. I’m only just scraping the surface. As I find them out for myself, I’ll be adding them to the list here. If you know of one not mentioned, please let me know so I can add it as well! Happy eating! By the way, if you like this post, please consider pinning the images below to your Pinterest boards to share it with your friends and followers! Why not add one of these foodie things to do in London to your itinerary? Looking for fun food activities in London? Here’s a list of our favorite foodie things to do in London. This entry was posted in Food, Things to do and tagged England, London. I am quite literally saving this and will devour (pun intended) every bit of it. We are heading back to London very soon and I will do all of these things that we haven’t done yet. I hope you’re able to try some or all of these. London is such a fun place to be for food activities. There are tons! I would spend hours at the cheese shop Laura. Although that hot cocoa with shards would reel me in too. Like many awesome big cities, you will never run out of fabulous culinary experiences in this inspired city. Now you have me dreaming of cheese in a place where cheese is hardly awesome LOL! I know right! The chocolate place is one of my favorites. OH YES!!! I found this piece thanks to pinterest. With your Borough Market on the #1 you already got me 😀 LOVE this place! have you tried any of the Caribbean food there? I haven’t seen any, but for sure the cheese, wine, beer and fruit stalls all over the place! I wrote up a tiny piece about my own fun things to do here I enjoyed, this is a great add-on. https://hostelgeeks.com/27-fun-things-to-do-london/ I will share yours now on Pinterest! Hey Matt. Thanks for dropping in. We do love Borough Market! I haven’t tried the Caribbean food yet, but it’s on the list!